There’s never been a better time to be a beer drinker — and Chicago, with its thriving brewery scene and many destination-worthy beer bars, is the perfect city for suds lovers. Visit four of its craft breweries on this all-inclusive, 4-hour tour, where you’ll get to tour brewery production facilities and enjoy copious samples of local brews. 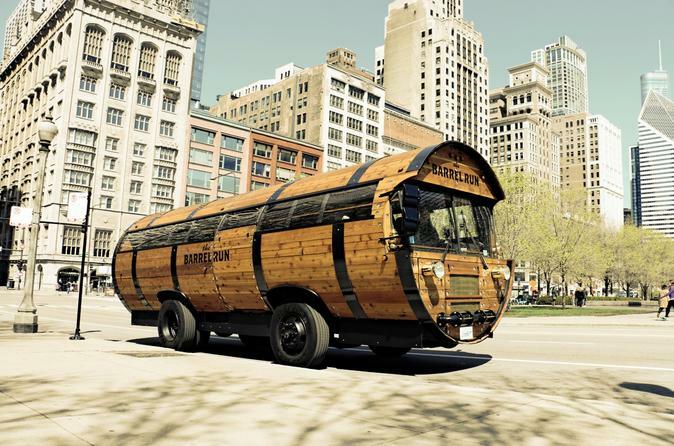 To keep things interesting, you’ll travel in a barrel-shaped bus. Morning and evening departure times are both available. Chicago is a beer lover’s town, and on this all-inclusive, 4-hour tour, you’ll travel around the city in a quirky, barrel-shaped bus, sampling its many suds. Depart at either 11am, 7pm, or 8pm, and look forward to visiting four of the city’s breweries. As you drive around town, your guide will provide historical context for the city’s recent craft beer resurgence, detailing the rise of its brewing industry in the 1800s, the fact that Chicago’s first mayor opened a brewery, and the impact that Prohibition had on the fledgling industry. You’ll stop at four different breweries as part of this tour, from big names like Lagunitas to several of the city’s smaller, upstart craft breweries. As you go, learn more about the science behind the brewing process, enjoy an informative tour of brewery production facilities, and get ready to do some sampling. Taste a number of different brews at each stop; you’ll consume roughly 50 ounces of beer during the tour, which adds up to about four bottles’ worth of suds. Attendees must be 21 years of age and older to join the tour; please bring along your government-issued photo ID. The tour concludes at your original point of departure.